When your daughter or son calls and says, "You are going to be a grandmother" then it is time to plan a special baby quilt. My daughter Jill decided that the theme of her baby Audrey's room would be owls so I did an extensive internet search for owl quilts. I was thrilled to find a blog by Angie Padilla where she mentioned a quilt she had designed called Life's a Hoot. I ordered the quilt pattern from Angie's Quilt Pattern Shop. It is an E-pattern. That means after you have paid for it you download it from her site as a PDF and print it out yourself. The advantage of doing this is that you get it immediately and there is no shipping and handling. Since owls are night creatures I decided to choose a dark blue background. So then the challenge became to pick fabrics bright enough to contrast with the background. All the owls are from scraps that I have in my stash. The tree fabric was a lucky find...a batik with trees printed on it. It has enough design texture to it to look like tree bark. The one addition I made to the quilt was the little Blue Cat in the corner to represent me. I had always planned to add a blue cat to the quilt but couldn't find an image that fit with the feel of the quilt. I was flipping through an issue of Quilt Mania, my favorite quilting magazine. In an article about Japanese quilt makers and there was a figurine of a cat. 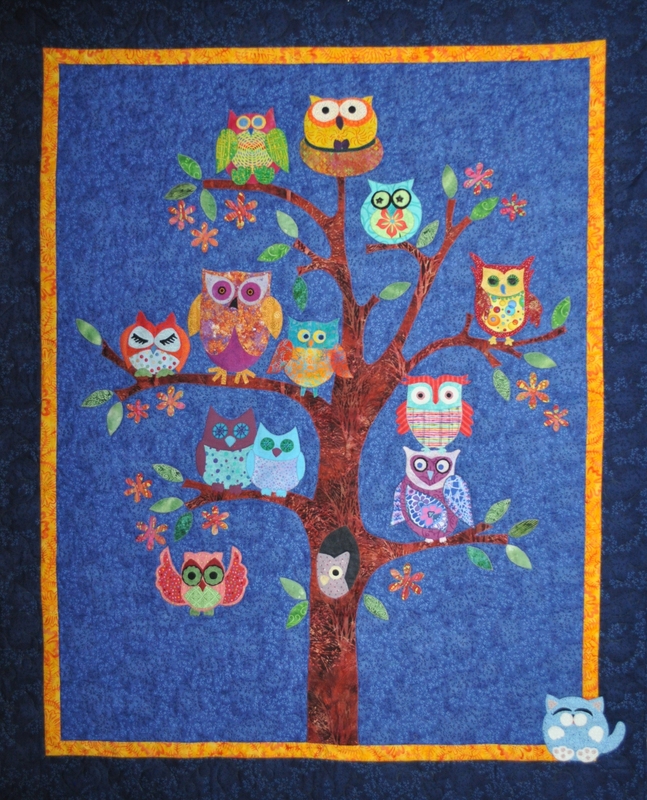 I knew immediately it would be perfect with the owls in this quilt. I hope my little Audrey enjoys spending the next few years playing on and covering up with her owl quilt. The quilt is 42" x 52". It is raw-edged machine appliquéd and quilted.